Each drawer is 6" wide x 7-7/8" long x 4-1/2" high | the inside drawer dimensions are 5-3/8" wide x 6-3/8" long x 3-1/2" high Use these drawers stacked or individually to store multiple cosmetic items. Also great for storing jewelry items. Add additional drawers for even more storage space Each of the drawers can be removed completely for easy access and portability and can contain up to 24 standard sized bottles of nail polish per drawer The durable material will stand up to everyday use and cleans easily with soap and water | Proudly made in USA Other items in the Audrey Collection include: Cosmetic Storage and Makeup Palette Organizer, Cosmetic Storage and Makeup Palette Organizer with 1 Standard Drawer, 2-Pack Stackable Cosmetic Storage and Makeup Palette Organizer Standard Drawers Need just a little drawer or 2 to hold your everyday necessities? 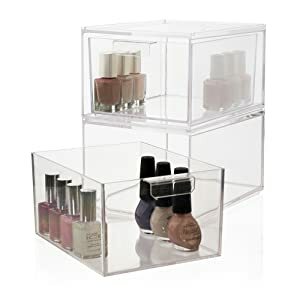 From nail polish bottles to cotton balls to your daily make-up essentials, these 2 sturdy clear drawers keep you organized and allow you to find everything with ease. The Audrey 2 Drawer Cosmetic Organizer components can sit side by side or stacked up to save counter space. Each of the 2 drawers can be removed completely for easy access and portability. Add and customize other Audrey components to build your own cosmetic station that will fit your everyday needs! Made in USA. 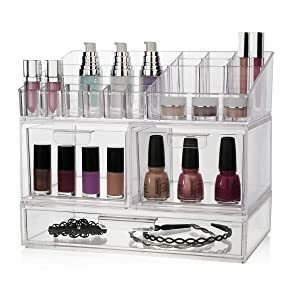 Audrey Collection Drawers Make Organizing Cosmetics Easy! Cosmetics piling up and cluttering drawers and countertops? Can't resist the fabulous new shades of eye shadow and lipsticks this season? 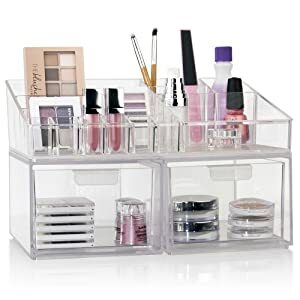 No need to worry with the Audrey Cosmetic Storage and Makeup Palette Organizer Drawers. Made from premium quality material, your collection will not only look beautiful but be neatly organized and at the ready when you are. The durable material will stand up to everyday use and cleans easily with soap and water. Add Additional Components from the Audrey Collection for Even More Space! 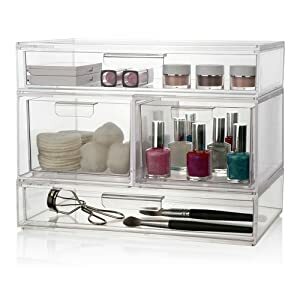 Add the Audrey Cosmetic and Makeup Palette Organizer to the top of your drawers for items you use everyday. From lipsticks to brushes and more, your daily routine will be a breeze! Add a couple of Audrey Large Drawers for even more storage space. Drawers are a great way to store larger items such as makeup palettes or items that don't get used everyday, like manicure supplies. The best part? Each of the components neatly stack on top of each other, in whatever configuration you choose! No more taking up valuable space on your vanity or countertop. Finally, Cosmetic Storage That Fits Your Needs! Audrey drawers come in several sizes to fit whatever items might be in your collection. Nail polish? No problem! The tall drawer set is great because each drawer can be removed completely for portability. 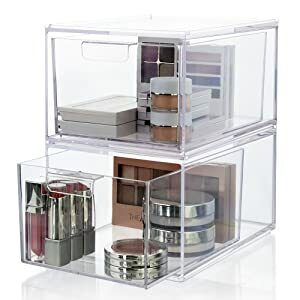 Why pack everything away in a train case when you can use these clear drawers to easily see all the items you might need to get ready in the morning or for a night on the town! The Audrey collection is awesome because you can configure it any way you want. Satisfy your inner makeup artist by keeping organized and never having to say no to those new colors that you just have to have!